Palwasha is originally from Pakistan and came to Ireland in 2008 on a spouse visa to join her husband. He came to Ireland to do his Masters in Computer Science and got a job offer immediately after completing the studies. Looking at her husband’s progress, she was very hopeful for her future in Ireland. Palwasha has a Bachelor’s Degree and Masters Business and Finance with a distinction and gold medal. 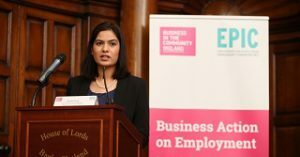 Being a high achiever in academics and having work experience in the sector, she thought that getting a job in Ireland shouldn’t be too difficult. This said, it took her 7 years to find work. After living in Ireland for 3 years, Palwasha got the status needed to work without any restrictions. She applied to hundreds of jobs but was unsuccessful and couldn’t understand why was not called for interviews. Palwasha found the EPIC Programme doing an online search and immediately got enrolled. Attending the mock interview with CPL helped her to further her interview skills. The training and individual support boosted her confidence by learning the skills needed to create a successful CV and Cover letter and to present herself in a professional manner. She also was able to get references and guidance on taxation issues and rights and entitlements regarding working in Ireland. She is now in full-time employment with a leading financial company.